Ron Howard's father was a writer for The Flintstones and an occasional actor who would bring his son onto the set with him. In Frontier Woman, an abysmal western featuring the elder Howard, young Ron made his film debut at the age of one. He was famous playing Opie Taylor on The Andy Griffith Show, and remembers that even at the age of six or seven, the program's producers welcomed and incorporated his suggestions. Later child acting included The Music Man with Robert Preston and The Courtship of Eddie's Father with Glenn Ford. As a young man, he starred as a hick opposite John Wayne in The Shootist, as an everykid in American Graffiti, and as Richie Cunningham on Happy Days. Still, when Howard first said he wanted to direct, it was generally taken as an unintentional joke. Howard made a deal with low-budget producer Roger Corman, agreeing to star in Corman's Eat My Dust if he could star and direct the subsequent Grand Theft Auto. Eat My Dust made money, as most of Corman's films did, but Grand Theft Auto made more, and its success allowed Howard to direct several television movies during Happy Days breaks. After the sitcom ended, he directed Night Shift, which made Michael Keaton a star, Splash, which did the same for Tom Hanks, and Cocoon, which made Howard's name as a director. Virtually all of his previous work had been in comedy, but Cocoon -- science fiction with an all-star cast of Hollywood elderlies -- was unexpected. Howard's best accolades have come for Parenthood with Steve Martin, Apollo 13 with Hanks and Bill Paxton, and A Beautiful Mind with Russell Crowe. Howard received the Best Director and Best Picture Oscars for A Beautiful Mind. Howard makes enjoyable popcorn movies that do not insult an audience's intelligence. 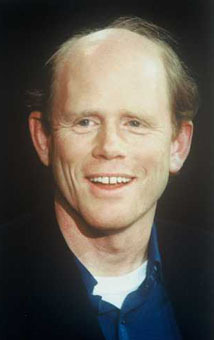 His "controversial" adaptation of The Da Vinci Code, which infuriated Opus Dei and was called sacrilegious by the Catholic Church, was a harmless spy thriller, and even Howard's critical failures, like How the Grinch Stole Christmas, tend to do well at the box office, while his box office duds like Cinderella Man at least earn good reviews. His films often feature roles for his brother, Clint Howard, their father, Rance Howard, and Howard's wife, Cheryl. There was even a part for Corman in Apollo 13. Still active on television, Howard produced 24 with Kiefer Sutherland and Arrested Development with Jason Bateman.